Is it possible to have too much of a good thing? 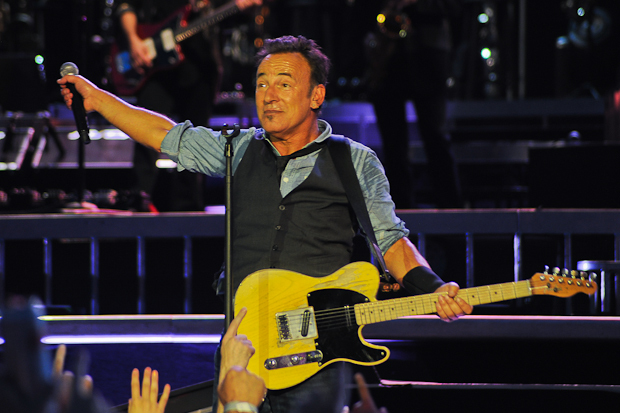 Is a three-hour and forty-five minute Bruce Springsteen concert just too much? Yes and no. 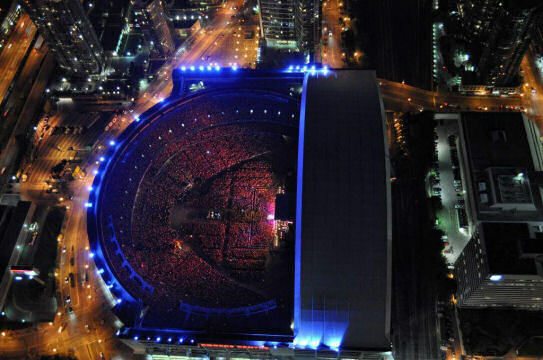 I knew going in to last Friday’s Springsteen concert at Toronto’s Skydome (I refuse to call it the Rogers Centre because it sounds too much like a shopping mall) that that was what 40,000 of us were probably going to experience. But until you live through this emotional roller-coaster – the driven, full-on, balls-to-the-wall party which is a concert by Bruce Springsteen – you really don’t know what to expect. For years, Springsteen has maintained that if you pay good money to see him perform, whether the concert is in New York City or Poughkeepsie, you are going to get a show of equal skill, length and passion. (And unlike other performers – I’m looking at you, Madonna – who gouge their customers to see them “live,” Springsteen’s tickets are kept at a very reasonable price, and he and his band actually perform and sing live.) There’s no question he fulfilled that promise on Friday night. Musical tastes change, and I basically stopped paying attention to Springsteen’s output in the mid 1990s. I’ve heard songs here and there over the years from after that period that I've liked (especially his fine 9/11 album, The Rising, and tracks from his new CD, Wrecking Ball), but I certainly wouldn’t describe myself as a fan anymore. I found myself at the concert more out of curiosity than as someone committed to his music. Our seats were of the nose-bleed variety, a scant seven rows from the top. We were also on an oblique angle to the stage. This was a problem because I don’t really think they properly figured out where to put the video screens. One was on far stage left (unseen by us); the big main screen was centre stage behind the band (again out of view); and then there was the one on stage right that we could see (or could have if it hadn’t been partially blocked by light scaffolding). And yet even with this huge limitation within the rotten, echoing sound of the Skydome, on this gorgeous night when the open dome made the sound even worse, this was one of the finest concerts I’ve ever seen. Due to location, and an imbecile right in front of us who thought it would be a great idea to stand up right at the start when there was no need (the less said about him the better, but I did let the idea of tossing him over the edge pass through my mind), it took until the fourth song, “We Take Care of Our Own” from Wrecking Ball, before things clicked into place for me (by this time, we’d already gone through a trilogy of songs from his 1981 album The River, “Working On the Highway,” “Hungry Heart,” and “Sherry Darling”). Part preacher and part carny, Springsteen ripped through “the first four” without much more than a “Hello [insert city name here].” (Another great nugget from the New Yorker piece is that he always has a big sign just near the stage entrance telling him where he is because he has screwed up in the past.) Once the fans are in his pocket with the first three, he begins to reel in the non-fans with the songs after that. How does he do this? The seventh song he played was “My City of Ruins,” one of the great tracks off The Rising, which finally hooked me completely. He used this song to introduce the band for the first time (there were 17 people on stage), and then he said, “Are we missing anybody tonight?” again and again. Without question, he was referring to former saxophonist and foil Clarence 'Big Man' Clemons and organist Danny Federici, much missed members of the E Street Band who passed away in 2011 and 2008, respectively. But what he was really doing was getting us all out in the dark to reflect on who we were all missing. Since my wife and I both lost our fathers in the last 20 months, we immediately called them to mind. The emotion derived from that connection and the 14-minute version of the mournful post-9/11 song that followed made the personal universal. From that second onward he had us both. It also helped that the performance of that song by the whole band was masterful. Much of the rest of the concert built on these feelings, making this huge inappropriate-for-the-true-appreciation-of-music venue remarkably intimate. Springsteen may have been a speck on stage, but he managed to make you feel you were watching him in a small club. It wasn’t all perfect. The audience-request jive was hit and miss. The second request (the frat-rock “Sherry Darling” was the first) was for a track called “Thundercrack,” an old fan favourite from his early '70s shows which didn't get officially released until his 4-CD box-set omnibus Tracks came out in 1998. He performed it because he was amused by the fan's sign requesting it. It showed a line drawing of someone’s derriere with a lightning bolt coming out of it and with “Springsteen” tattooed on one cheek. This is where the danger of throwing curveballs at his band can lead to ragged moments. The group had played it before on the tour, but obviously not enough. Combine a slightly unfocused performance with a song that just isn’t that good and you risk weakening the night. The same was true when they did “Rosalita.” Oddly, the band seemed unprepared, despite the track being a standard show-closer in the repertoire for years. Or we may walk until the daylight, baby." Or we may walk until it's daylight, maybe." It was a near perfect moment in the night because it served two purposes: it was filled with true emotion; and it was a quiet song that led us out of the earlier sonic assault before we were plunged back into another with “The Rising” and “Badlands” ending the night before the encore. There are other moments before that encore that I must mention. The lead guitar playing by Steve Van Zandt and Nils Lofgren was a wonder to behold. These are not young men, but they sure act like they are. Lofgren was whirling like a dervish as he played “Prove It All Night” with his head shaking in joyous abandon (remarkable, since he's had double-hip replacement). The drumming by Max Weinberg throughout was pretty spectacular, but especially on the percussive, hard-driving “Candy’s Room” (a personal favourite). For a man who’s recovered from a heart attack and prostate cancer surgery, and had two failed back operations and seven hand operations, he still played like a man possessed. Of all the players, the one who had the biggest shoes to fill (literally and figuratively) was Jake Clemons, Clarence’s nephew. He was asked by Springsteen to play Clarence’s role in the band for this tour. His sax playing was fine and he was well appreciated, but you can tell he’s still trying to throw off some tentativeness that comes with taking on a part played for so long by his uncle. It would be daunting in the best of circumstances, but performing in front of over 40,000 people night after night it must be especially so. I won’t say much about Springsteen’s habit of selecting one young person to come up and sing with him during the performance of “Waitin’ On A Sunny Day." My colleague said it best. She has serious trouble with this practice because amongst the super-fans it has become a competition to get their child thrust up there to sing. By doing so, the parents end up fulfilling their own wishes through their young children and it becomes a side show. The girl selected on Friday night was given two years of singing lessons by her parents and then made to memorize the song on the off-chance she was picked. She was, but can you imagine how those who may have done as much work but were not picked must feel? 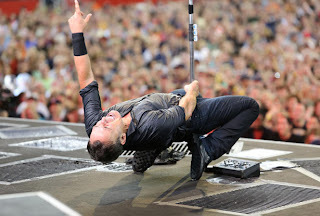 Here we have an example of Springsteen's carny side. The nine-song encore built to a climax that may have been taken one song too far. Among those songs were classics like “Born to Run,” “Thunder Road,” “Dancing in the Dark,” “Tenth Avenue Freeze-Out” (Springsteen’s longer tribute to Clarence during this was quite moving), “Twist and Shout/La Bamba” and finally “Glory Days.” Sure, we were all on our feet, singing, clapping and having the time of our lives, but I remember thinking, as the tremendous cover of “Twist and Shout” came to an end, ‘okay, I’m good. That’s all I need. I’m sated.’ And then he played one more, because I really think he was having too much fun to stop. Yes, his ‘exhausted’ act before “Tenth Avenue” was staged, but I got the feeling he didn’t want this night to end. My colleague, who could see the centre screen since she was in the pit, told me the next day that when Springsteen counted the band into the song you could clearly see the look of murder on Max Weinberg’s face. After all the work he’d done, he was probably in pain. So were we, but ours was of the more joyous kind. 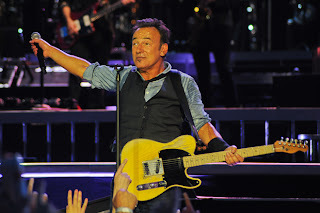 For a taste of the concert, here's a link to Springsteen's performance of "My City of Ruins." And here's "Incident on 57th Street." 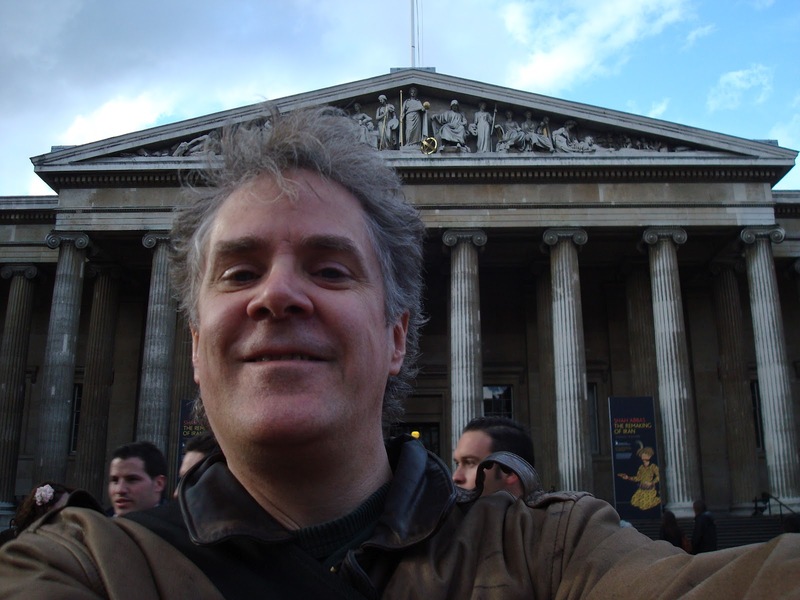 – David Churchill is a critic and author of the novel The Empire of Death. You can read an excerpt here. Or go to www.wordplaysalon.com for more information (where you can order the book, but only in traditional form!). And yes, he’s begun the long and arduous task of writing his second novel.